FAQ:QuickBooks Inactive Sales Tax Item Still Used? If you make a sales tax item inactive in QuickBooks (which you might want to do if your tax rates change mid year, as I talk about in this article), you may find that when you add a new customer that this inactive sales tax item is still showing as the default item for the customer. How can you change this? This is controlled by a preference. Select File then Preferences and locate the sales tax preference. 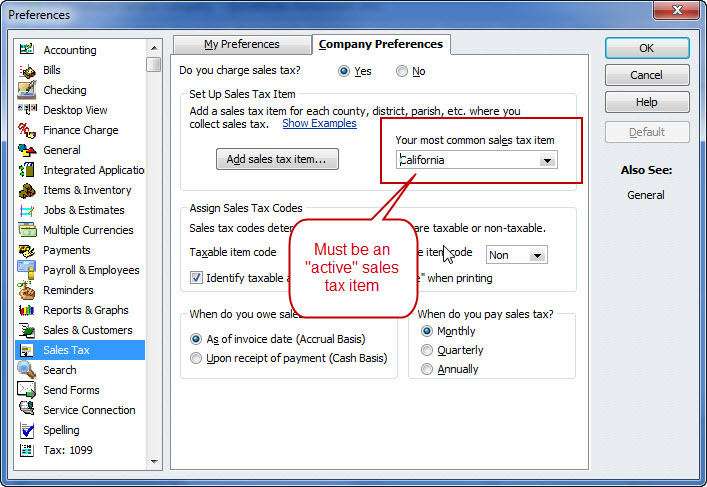 In the Company Preferences tab, look for the option Your most common sales tax item. Most likely this is still pointing to the inactive item. Change this setting, and when you add a new customer QB won’t default to the inactive item. Wow, Charlie, you are my hero once again. I have a client that does work in Massachusetts. As you may know, in July, they changed their rate. I have been “bugged” by this issue and always had to “watch” when I entered a new customer because it kept selecting that old Mass. tax. I was slightly “annoyed” that I could not just change my rate without changing past transactions. Never even thought to look at the preferences setting. I will definitely correct that on his file. I have changed preferences, but would like to change tax default so that tax changed automatically. Any suggestions? Barb, I’m not quite sure what you are asking, can you explain in a bit more detail? I alo have business in MA and on July 1st, the sales tax was changed. I did know to go to the Company Preferences tab, look for the option Your most common sales tax item and click the NEW tax code I use. ONLY issue is with PAST CUSTOMERS. The OLD tax is always the one that shows up. HOW do I get the NEW TAX to show up NOT ONLY for NEW CUSTOMERS, but ALL MY OLD ONES?